Talk about rise and fall. Facebook has been heavily promoting its new app Poke but, as quickly as it rose, so the app that sends ‘destructible’ messages has plummeted in app store ranking lists following Christmas Day downloads. On Friday, Facebook released the Snapchat-like app, through which users can send private messages that expire after 1, 3, 5 or 10 seconds, and it promptly hit the App Store’s number one spot within 24 hours. That momentum has ground to a halt however, and the app — which was built in just in 12 days — has fallen to a lowly 34th in US, as Ouriel Ohayon, founder of apps specialist AppsFire, points out on Twitter. The app is, however, ranked higher in some countries — it is seventh in France, for example — and given that the App Store is currently frozen for Christmas (during which no new apps can be added to the store) things are less clear. Nevertheless, Ohayon tells TNW the signs are not positive for Poke. “Right now iTunes is frozen so the ranking are less unreliable than usual, but one thing is certain, Poke’s ranking is on a downward trend,” he explains. Poke’s fall is a blow for Facebook since maintaining a visible position in the ranking list pays off double around this time of the year, as new users hit the App Store to find apps to download. Being top, or within the top 5/10, brings even more ‘viral’ downloads than usual. 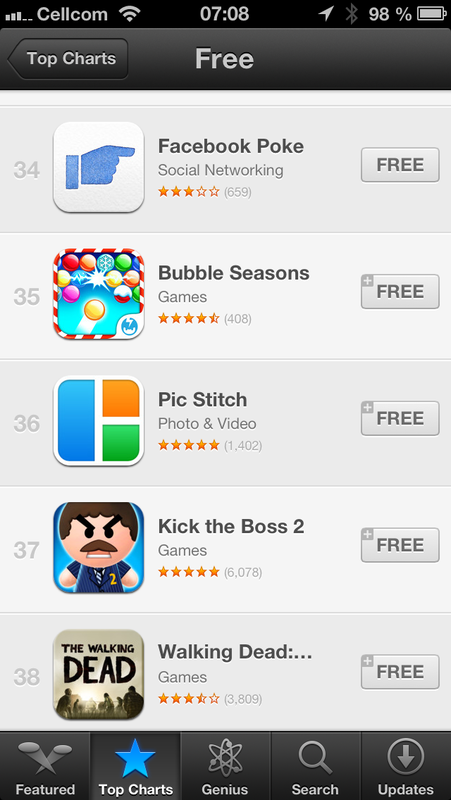 We did say that we didn’t expect the app to remain top for long but the speed of its descent has certainly surprised. Poke temporarily knocked Google Maps off number one, and that speaks volumes for the effort that Facebook put into its promotion — which included a very visible link at the top of the social network’s mobile site and app. There are few apps that can rival Google Maps for traction and, as was expected, Poke is far too a niche product to be top of the charts for a long period. More than being limited to appealing to a selection of Facebook users, it will likely be confusing to a great many more. The New York Times’ Brian X. Chen calls it a “head-scratcher” for adults and you can imagine new users asking: ‘Why can’t I add photos I already took?’…’Why do they have to expire?’…’Why would I use this instead of Facebook Messenger or WhatsApp?’. Without wishing to cover old ground — see: Should startups bother having original ideas if big companies can just come along and clone them? — yes, Facebook can develop and roll out its own version of what’s hot, but no, that doesn’t guarantee success. Snapchat has developed its own community of dedicated users and that’s distinctly different to introducing an similar service to the vast, billion-plus userbase of Facebook. Perhaps a sign of my age or evidence of how new it is, but just three of my near-300 Facebook friends have installed Poke. Admittedly these are early days, but the app didn’t last long on my phone. Facebook will undoubtedly continue to promote the app, hoping to encourage usage through the ‘network effect’, but Poke hasn’t got the start that its creator will have hoped for.